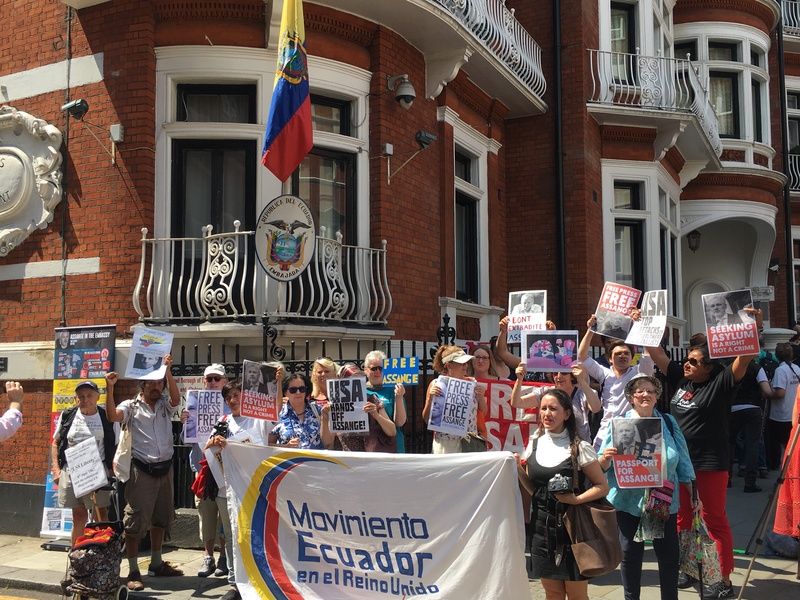 Over 100 people joined the solidarity vigil outside the Ecuadorian Embassy in London between 12 noon and carrying on till 7pm the same day. The diversity of people attending was great, different ages, nationalities. 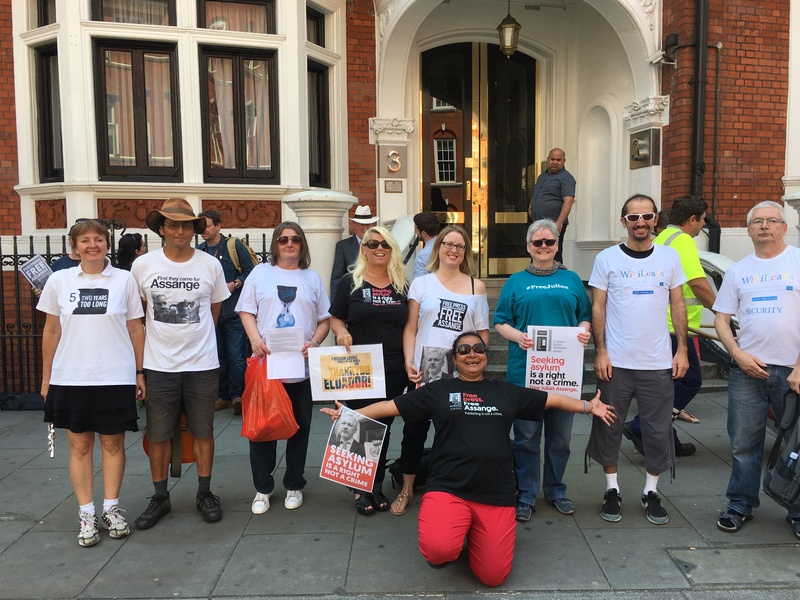 We mixed, talked listened to music, we shared news, supportive messages, stood holding messages of support, signed a letter to the local MP appealing for her assistance in ending the deprivation of Julian Assange’s liberty. 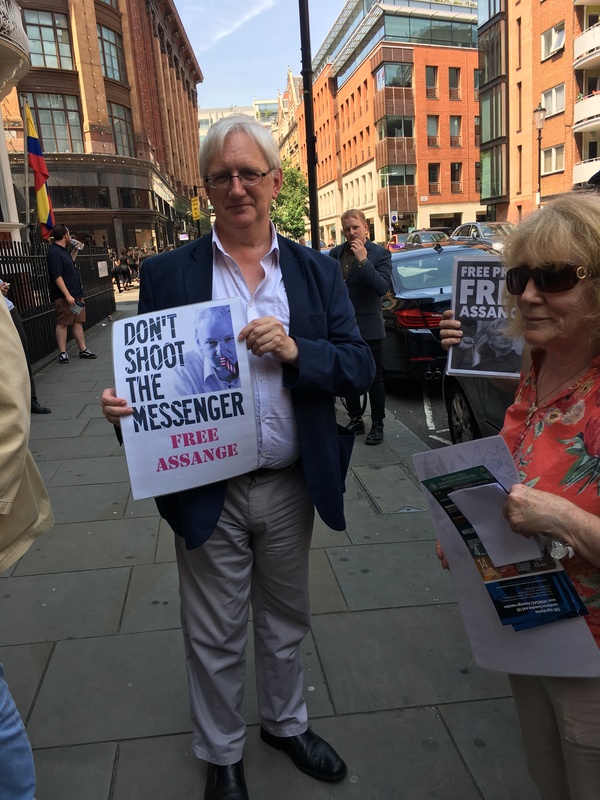 Many well known supporters of WikiLeaks and Julian Assange joined us in solidarity and as we inspired each other, the message was clear, “Free Julian today, now”, “Safe Passage” “Thank you Ecuador”. 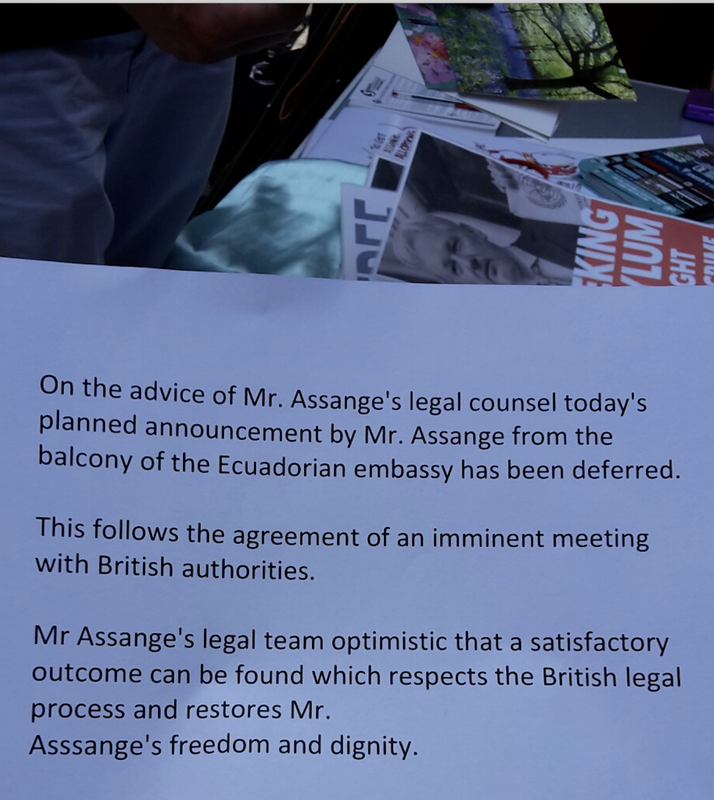 Despite some disappointment in hearing that Julian Assange will not be making a special announcement in person from the balcony of the Ecuadorian Embassy as the circular below by WikiLeaks informed us, we were heartened by the news that his ordeal might be soon over, restoring his freedom and dignity. 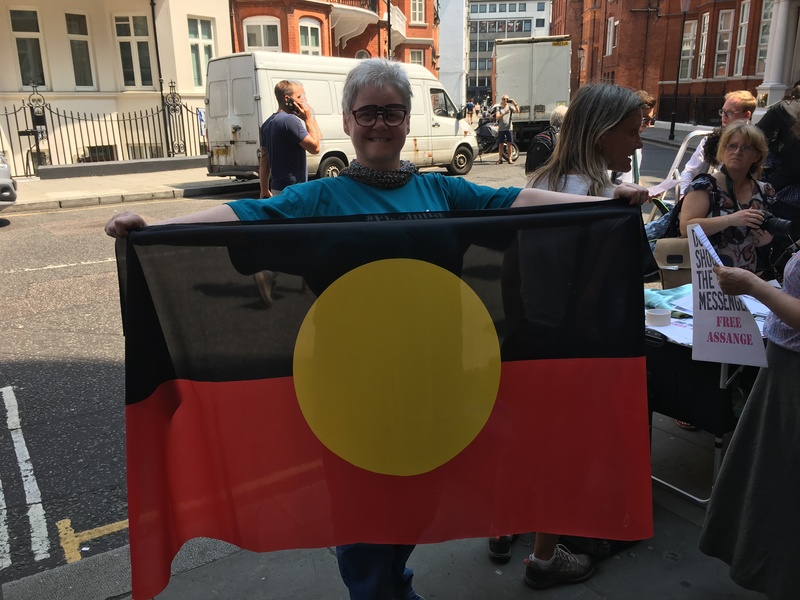 A supporter brought over an aboriginal flag from Australia, reminiscent of Julian’s origins in that country, it’s colonial past, the struggle for Human Rights to this day in that continent in parallel with his struggle for freedom. 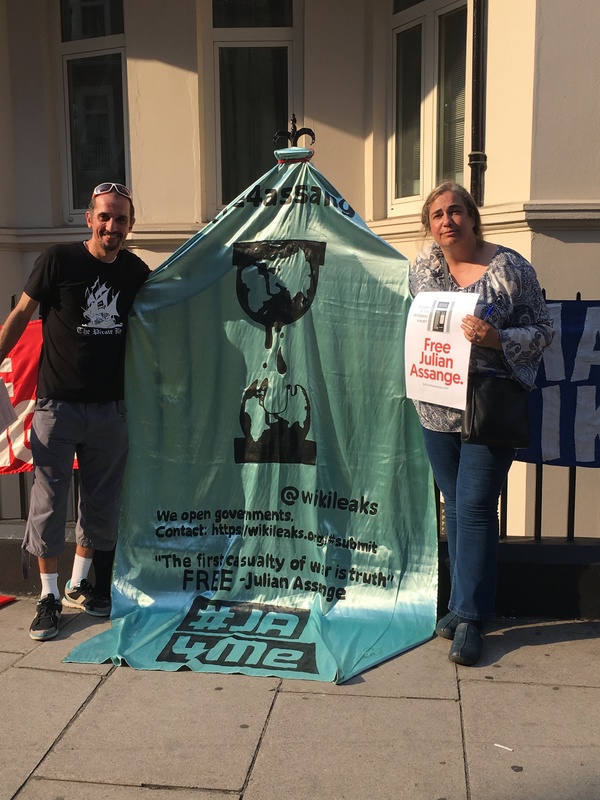 We remember that the WikiLeaks editor has received an aboriginal passport whilst his own Australian government has abandoned their duty to honour their obligations as per his Australian passport, held for years by the UK authorities. 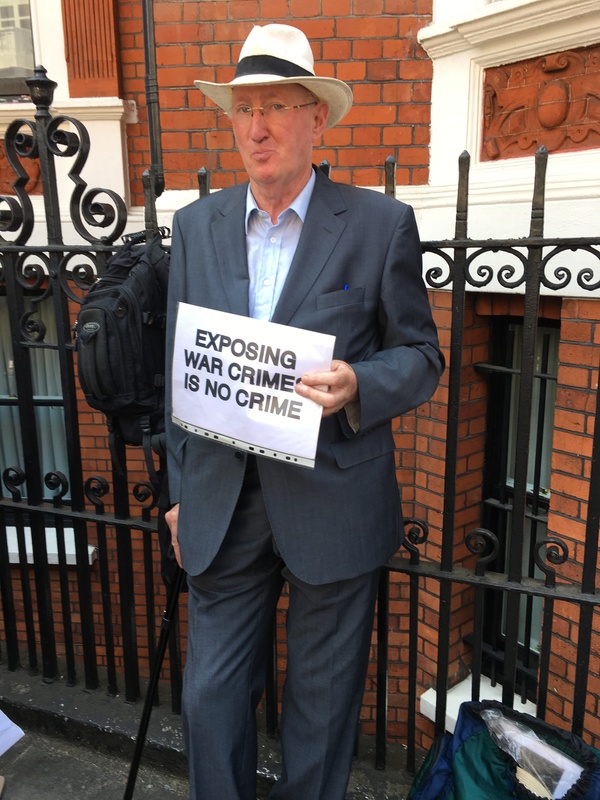 Long time campaigner against extradition Jim Curran and one of the very first attendants at the solidarity vigil added his voice in support of WikiLeaks “Exposing war crimes is no crime”. 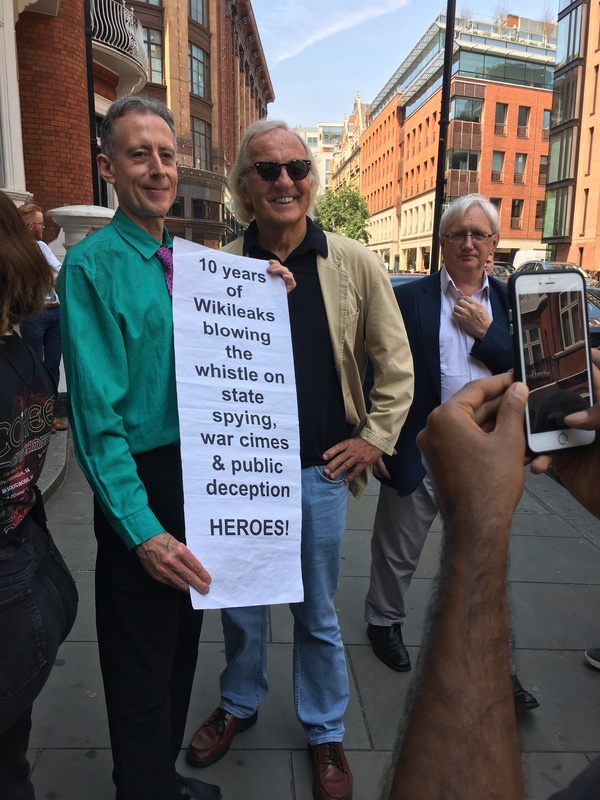 Peter Tatchell adds his voice in support of heroic WikiLeaks, standing by his side John Pilger and Craig Murray, long time friends and allies of Julian Assange. Craig Murray, recovering from a nasty flu, took his place in the barricade on the side of truth and justice in protection of its messengers. Multinational contingent holding banners, joining in wishing him Freedom in English and Swedish! Beautiful posters in display created by our wonderful Somerset Bean, graphic artist extraordinaire whose work is so loved by many supporters. His generosity and art is inspiring :-) Ecuador once more was praised and thanked for their stance in upholding Human Rights becoming indeed an example globally and breaking ground politically on how important Freedom of the Press is and the need to protect those who face backlash in the pursuit of publishing truthful information. 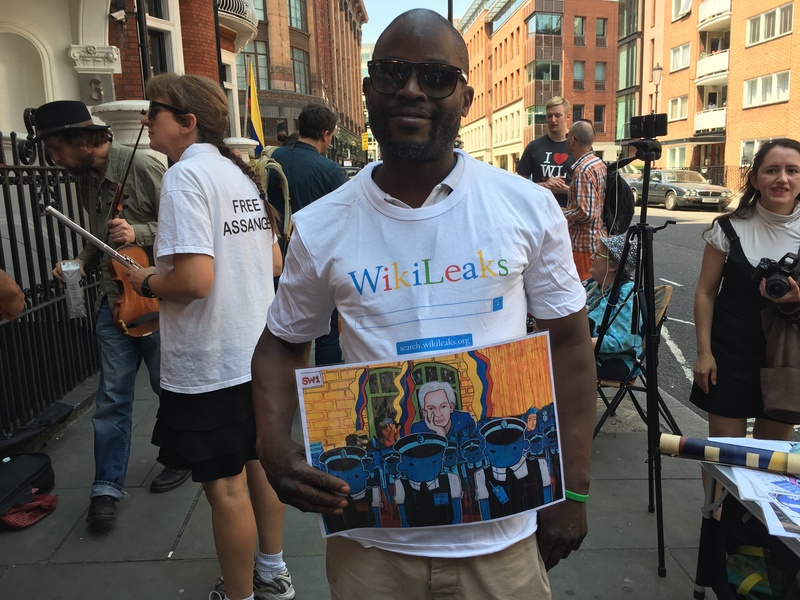 WikiLeaks supporter proudly wears his T-shirt holding “The Wikiman”—portrait of JulianAssange in the embassy by @toonpunk23 in London—mixed media on canvas. 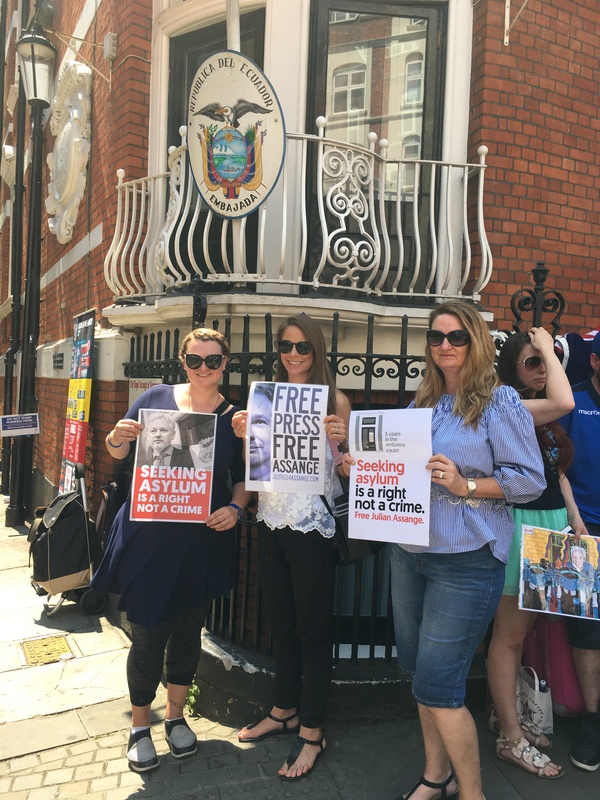 Seeking Asylum is a right not a crime and scandalous when a person is forced to ask for asylum when they are a member of the press world, the world of publishers of true facts! WikiLeaks Shop T-Shirt Line up in front of the Embassy of Ecuador. 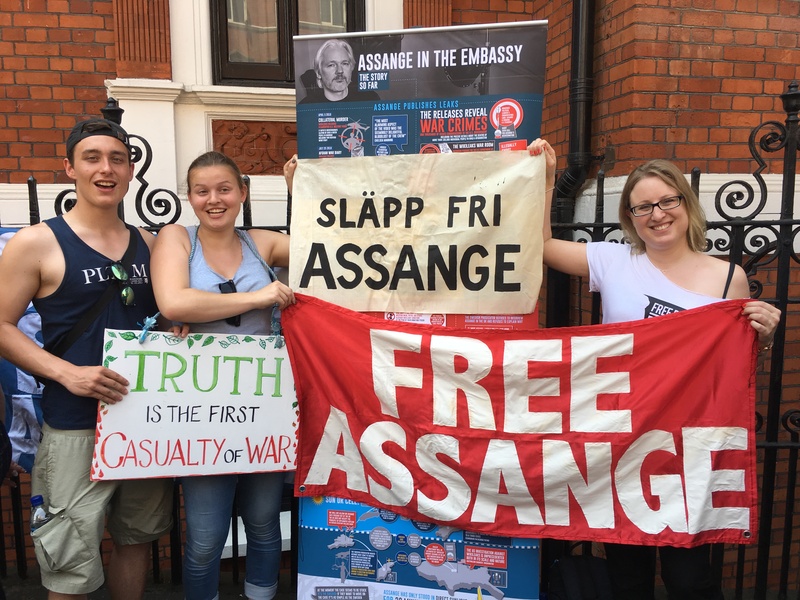 Invaluable collaborative work in raising funds for WikiLeaks! 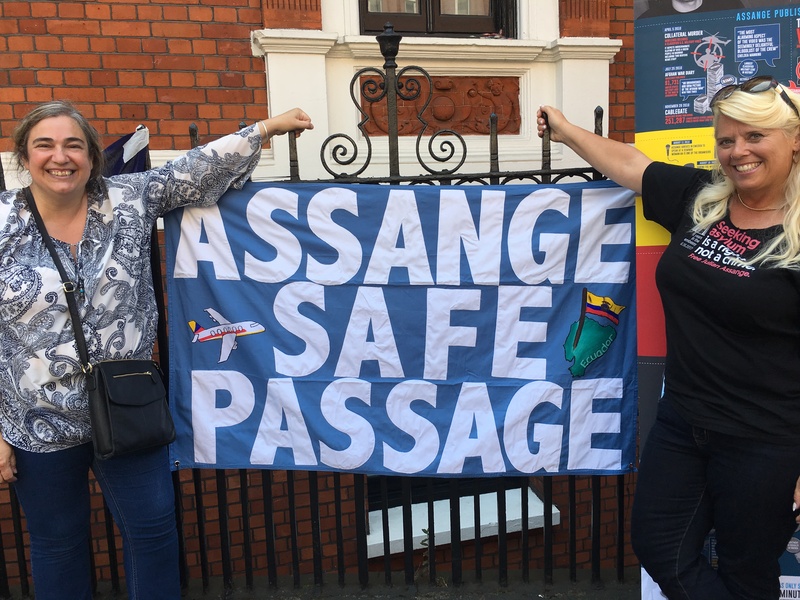 After Sweden rescinding their arrest warrant and closing their case, supporters in the UK turn their attention to the UK government’s role in arbitrarily detaining him, with a new banner, a collaborative work, asking safe passage for Julian Assange from the UK to Ecuador. All the way from Australia, thank you very much @SealSnap for your wonderful contribution to our event with this amazing banner. 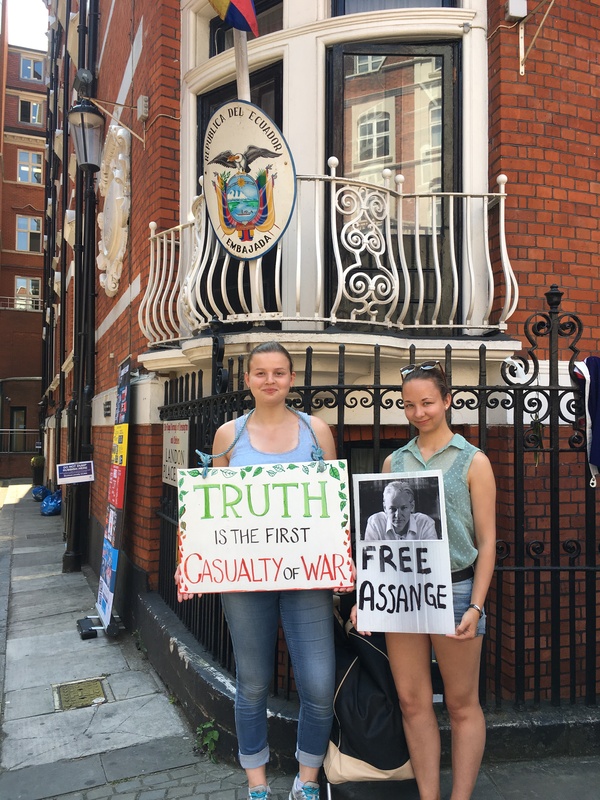 5th Embassy Anniversary in solidarity with Julian Assange and WikiLeaks . Here with @Liberte_info. 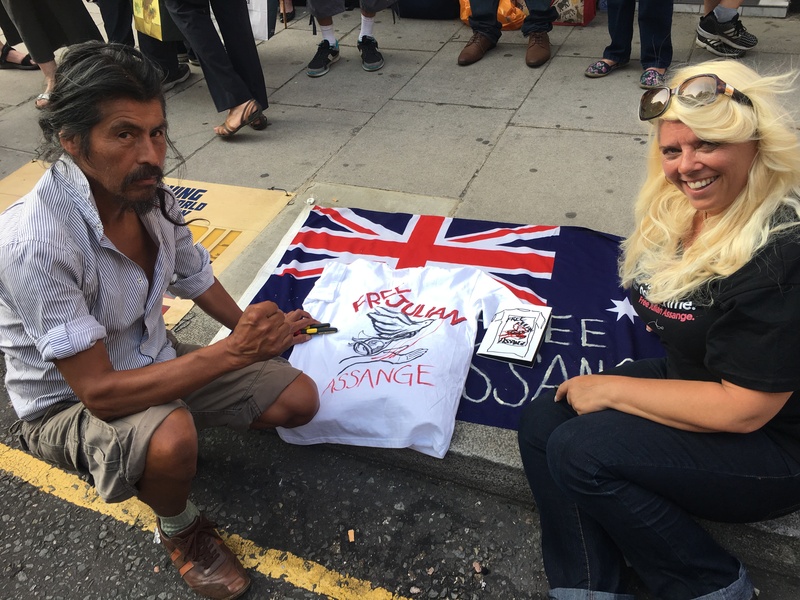 He worked tirelessly in canvasing support for our letter to the local Member of Parliament appealing to her to intervene in facilitating the end of Julian Assange’s arbitrary detention. 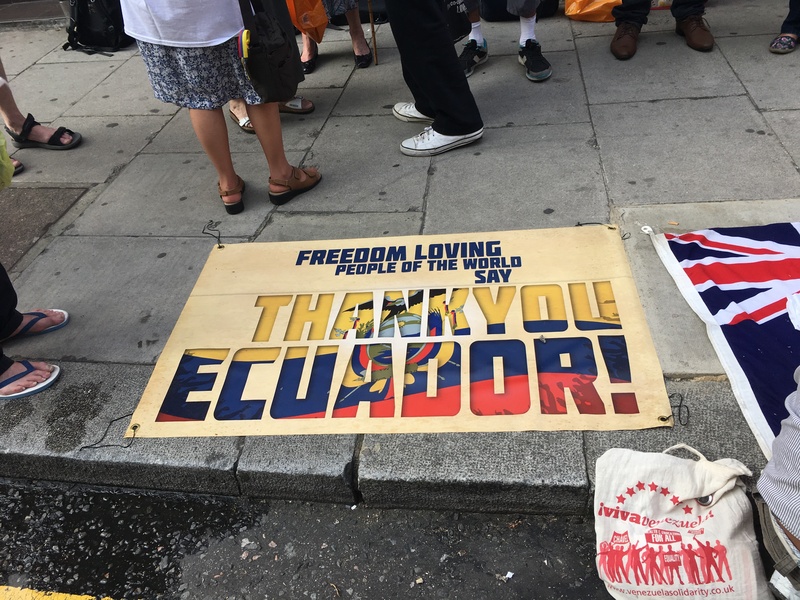 Always remembering how amazingly brave the people of Ecuador have been as well as their elected representatives in standing by their higher principals for Human Rights protection of political refugees. You can listen to some of the messages and statements of support below. Sue, Roland and Alex kept our ears tuned to solidarity music, “Any day now, any day now I shall be released, every man should be protected…” and this is the message in many of the supporters’ hearts and minds. We had a brilliant time sharing solidarity and being with like minded people in an excellent atmosphere. Everyone has stories to say about conversations, new people they met, building networks of support and being thankful for being able to do this solidarity work for our heroes of WikiLeaks and hoping that Julian Assange will be free soon to be re-united with his nearest and dearest, recover his health and be able to grow his organisation further with freedom of association and without 24/7 surveillance. Gallery | This entry was posted in Assange, WikiLeaks. Bookmark the permalink.